Crabel studied patterns of consecutive days up and down to see if they were predictive of the next day’s direction. In addition, he tested breakouts under different patterns. All of these were various numbers of ticks off the open. He tested a collection of different offsets in ticks from the open under given setups. Opening range breakout strategies performed exceptionally well from 1986-88. There was a fundamental reason for this success. Prior to 1988, key reports came out a half-hour before the bond market opened at 8 a.m., meaning the open expressed the results of the report. After the Chicago Board of Trade changed the bond opening to 7:20 a.m., this edge was reduced greatly. Another big difference in the opening range breakout from the 1980s to the early 2000s was that during a good part of this period, most trades occurred during the day session of the open-outcry trading pit. However, from 2003 to date, the markets have become electronic, with trading 24 hours a day. As liquidity during the overnight hours has increased, particularly since 2008, the open has become less important. 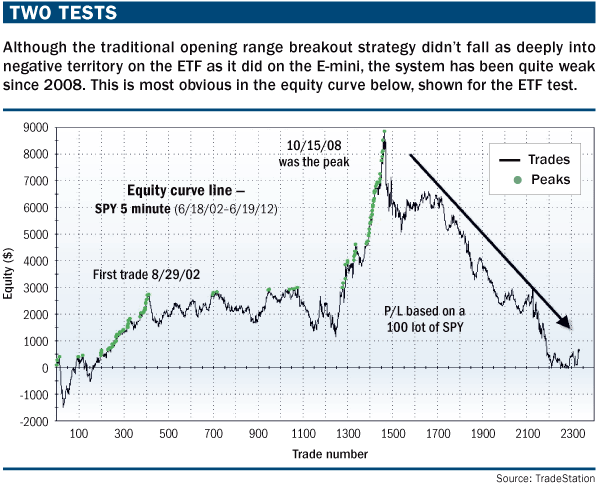 The results for a simple, unfiltered opening range breakout strategy are shown in “Two tests” (below). 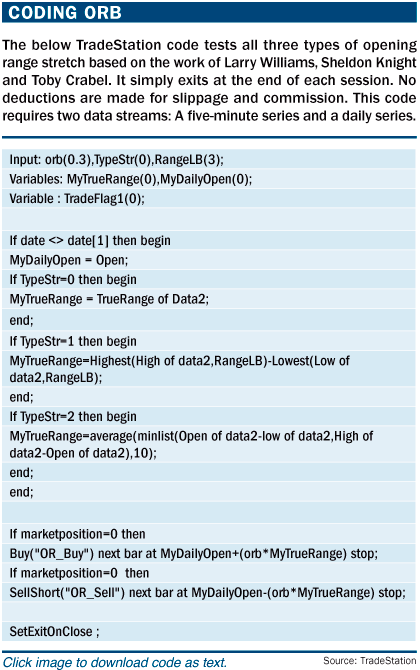 The tested system employs Williams’ offset calculation, using 30% of the three-day average true range (see “Coding ORB,” above). One set of results is based on the E-mini S&P 500, while the other is based on the S&P 500 SPDR exchange-traded fund (ETF). Both markets are derivatives of the S&P 500 index and could be expected to provide similar results. As we can see, however, the tests produced quite different results, although both failed considerably in late 2008. The equity peak for the E-mini was on Oct. 13, 2008. The strategy was up $33,000 but soon after, equity collapsed and now is down $21,500 for a loss of more than $54,000 after that peak. For the ETF, the equity peak occurred a few days later on Oct. 15, 2008, but it also fell off the cliff.